Mindfulness for adults has been studied for decades, and we know that mindfulness practice comes with many benefits. Research on mindfulness and children is not yet as extensive as with adults, but the amount of studies is growing rapidly and the results are promising. Children’s mindfulness training starts with learning focusing skills. When we learn to focus on just one thing, like taste, sound or our own breath, our mind calms down and grows stronger. Refined concentration skills, in turn, translate to improved performance. It helps children do better in sports, school or arts, and it will help them score higher on tests. We always do better when we’re able to pay attention to what we’re doing. When children practice focusing skills, they become aware of what their minds are really up to. 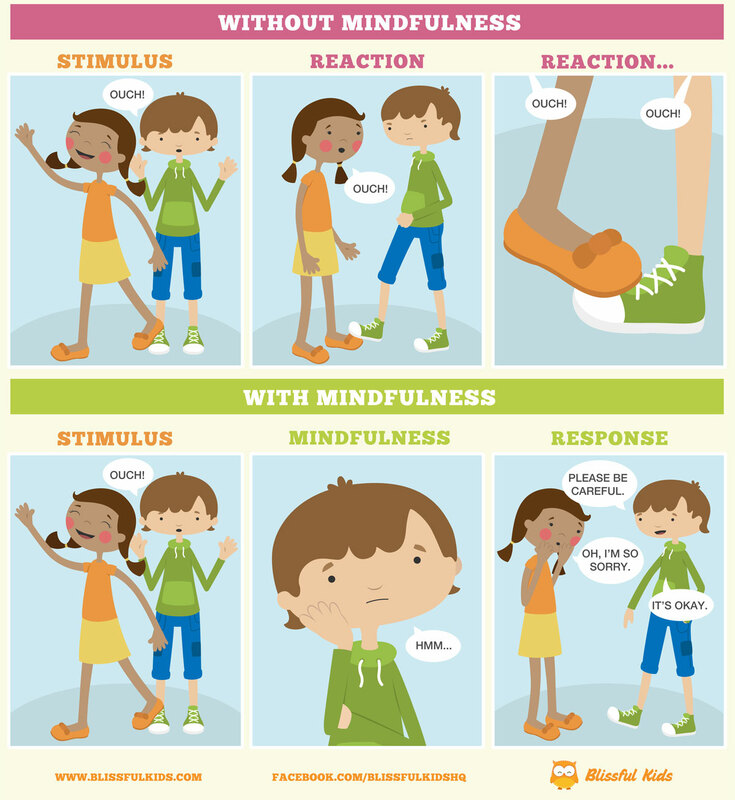 Mindfulness practice helps children deal with tough emotions and even improves impulse control. It replaces impulsive reactions with thoughtful responses. Without mindfulness we tend to be reactive, whereas with mindfulness we can respond in a balanced, rational way. Ultimately children can learn to steady themselves under sympathetic arousal to access cognitive skills. Mindfulness gives children the tools to focus their minds, calm down and reflect on a situation when they need to make a choice. When we’re aware of our inner life and are able to observe it, emotions and thoughts can lose their control over us, and we get more time to respond. With mindfulness practice, we can create space between the things that happen and how we react to them. We respond in a more balanced way, without hurting our own feelings or the feelings of others. As we create more emotional balance, we are less easily knocked down by our emotions, and in moments when we are knocked down, we bounce back more quickly. Most adolescents deal with strong emotions, and mindfulness skills can really make a difference. Mindfulness can be seen as a set of basic life skills that can improve performance in most areas of life, including school, sports, arts and social interaction. Last but not least, positive qualities that can develop as a result of mindfulness practice include empathy, kindness, well-being, generosity and compassion. How could mindfulness skills change your child’s life? Have you tried mindfulness with your children already?